PEANUT....the wonderful pit bull God sent into my life. Peanut and Mommie sleeping in the recliner. I rescued Peanut from a kill shelter at 3 months old. He came out of the blue and followed my daughter's co-worker to the P.D. where they worked. She called my daughter and said "look out your window and see what followed me to work". She thought it was a lab but my daughter was quick to point out "NO.....that is a pit bull puppy "! They brought him into the PD, my daughter started feeding him peanuts (thus his name) and my daughter called me and said "Mom, I found you a dog BUT it is a pit bull." My daughter knew that I had been wanting a dog but my husband would never allow one. So....I told GOD that if it was meant for me to have a dog, HE would send one into my life. As I was discussing the dog over my cell phone (we were traveling) my husband heard "pit bull" and said H*** NO ! Our local animal control officer had to come get him and take him to the shelter. On the following day, I went to visit him with my sisters and as we walked the LONG hall of death, there in the last cage was the little pit puppy....so sick, scrawney, curled up on a pillow. He could hardly stand. I held him and he nuzzled my neck and my heart was stolen. The animal shelter said I would have to be the first on the property at noon on Wed. to get him. Of course, I was the first one there. Many men had come and stated they wanted him (probably as a "bait" dog). Well, I got and paid the shelter a minimum adoption fee and took him to my vet. Peanut was sick with Parvo, they informed me. This was a Wed. and if I took him back to the shelter, they could not "put him down" until Monday. The vet said he would die a horrible death before Monday. I cried and told the vet to do all they could do to save him. It would be expensive and could not guarantee me he would live. Peanut's knee started to bother him, took him to my vet and they said it was dislocated. I allowed them to do surgery. He recovered well from that but all of a sudden Peanut started developing kidney stones. We took him many times for the stones to be irrigated out. One dreadful night, he got real sick and was it evident he was in tremendous pain. Took him back to the vet and this time she came out, sat beside me and said "I have called the Virginia Tech/Maryland School of Medicine and they want him there immediately". we left. Peanut was about a year old. The next morning they called and told us the dreadful news. Peanut was in renal failure from kidney stones blocked up and poisoning his body. I called my daughter and said we needed to drive up there so I could hold my precious Peanut when I had him put down. Much to my amazement and happiness, when I called them back...they said NO....we have a experimental surgery we would like to perform. It would be VERY EXPENSIVE ! I gave them the go ahead, knowing I would scrape every penny I had together to pay for the surgery. Praise be to God....Peanut survived the intricate surgery. They bypassed the urinary canal to his "privates" and put a female opening in him to allow for the better passing of any future stones. When we visited Peanut....oh, he was so bruised on his rear and bottom but they had prepared us for that. He loved us, licked us and we had a wonderful visit. Peanut was there about 10 days. They called him HOUDINI because he always managed to slip out of his containment area and come walking down the hall with his IV bag dragging behind him. We brought Peanut home with the LARGE circle ring collar to keep him from trying to reach his surgery area. He did so well and I am so proud to report that Peanut will be 3 years old this March and he is a wonderful, loving, caring, licking and kissing, gentle pit. He has NEVER shown agression towards anyone and Peanut gives me UNCONDITIONAL love. He sits on command, shakes hands, and still chews on his favorite toys and he loved tennis balls. I have a physical disability that I have had for nearly 11 years. I have difficulty keeping my balance and I fall often. Major medical facilities have not been able to give me a diagnosis unless it was a stroke. I try to work with Peanut to be an assistance dog for me. When I do feel up to it and the weather is good, I walk him and keep him close to my body. If I sway, his strength could keep me from falling. But for now, I am recovering from a torn menicus on my right knee and my doctor insists I do no even go into my yard alone. By spring, I am going to be brave and get Peanut out back in the neighborhood and start walking with him again. I also am a diabetic and Peanut often gets up close to my face and acts like he is trying to tell me something. My blood sugar was higher one time but not near as high as most diabetics can have. I thank God for Peanut every day. My husband LOVES him too, takes him outside to "potty" and has endured the fact that I bypassed him and saved Peanut from certain death. I am attaching many photos. The ones when he was a pup are on a disk but I have alot of him to submit him. 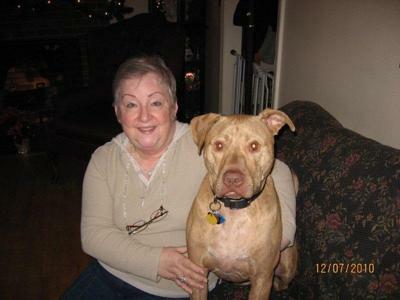 I AM A PIT BULL ADVOCATE AND I EDUCATE PEOPLE ABOUT THE BREED AND TAKE HIM OUT TO STORES WHERE THEY ALLOW DOGS. Comments for PEANUT....the wonderful pit bull God sent into my life. I HAVE TO SAY WHEN I READ YOUR STORY I CRIED. YOU BOTH ARE SO LUCKY TO HAVE PEANUT YOU SAVED HIM & HE KNOWS THAT & HE WILL GIVE YOU ALL THE LOVE IN THE WORLD. MY BUDDAH IS MY 2ND PIT & I LOVE HIM MORE THAN WORDS CAN SAY. THEY ARE THE BEST OF THE BEST SUCH LOVING CARING DOGS. I WISH YOU A LONG HAPPY LIFE WITH HIM BECAUSE YOU BOTH DESERVE THAT. 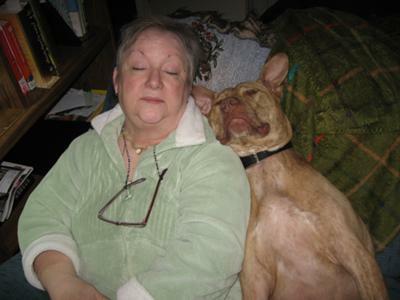 IT IS JUST TO BAD SO MANY MORE PEOPLE CAN NOT SEE WHAT GREAT FANTASTIC DOGS PITBULLS REALLY ARE. U ans Peanut are so blessed to have eachother and so glad am i that ur husband had change of heart.He looks like an absolute sweety pie. I pray u guys will have many more years to spend together and a special lil prayer just for u for healing and health. thanks for posting about ur sweet baby.in the future i will add more pics of Grip and Chopper. Peanut is now 3 yrs. 4 months old and he is thriving ! No more kidney stones we know of, playful, loyal, loves to sleep a lot and oh, I LOVE him unconditionally as he also loves me unconditionally. I am blessed to have Peanut !! I would like to announce that my Peanut is now a Mobility/Service dog for me. He has a red vest that says Service Dog and on the other side "ask to pet". He has a identily card that states him as a MOBILITY DOG and that I am the owner and handler. Cesar Milan told me that pit bulls could be assistance dogs and he sent me a video of a pit bull that assisted his owner who was in a wheelchair. Peanut has been through obedience training and he sits, lays down and jumps on command. I have taken him into Wal-Mart and he did SUPER. He was a little skiddish from all the people, kids getting ready for school, etc. but soon he settled down and walked close to me for his strength. If anyone bends down for a kiss, he lays a slobbery one on them. Peanut rarely barks. Mainly when he is playing ball with us. He can sense our daughter coming home from work about a mile before she gets here. His ears perk up, he looks out the window and awaits her. Congratulations to you and Peanut! This is wonderful news. What a wonderful story and I particularly got a chuckle out of imagining Peanut walking down the halls dragging his IV bag. It sounds like you rescued each other. Thank you to you and your husband for not giving up on this sweet puppy. Peanut is now 4 1/2 years old. I hate to report that he had to have ANOTHER kidney stone surgery about 2 months ago. We noticed he did not seem happy and that he had difficulty urinating. One day he had salivated a pool in the floor and we knew something was bad wrong. We immediately took him to the vet and after lab and x-rays....they saw multi LARGE bladder stones. He had surgery the next day and they removed about 30 stones. Most were the size of small acorns !! Poor baby :( The surgery was successful and now Peanut is so playful and you can tell he feels so good and RELIEF ! He is on a strict UT perscription diet but analysis of the stones showed NOT food related. He dropped about 10 lbs. FAST. We do add boiled chicken to his dry UT food and all the table scraps has STOPPED.....even though they said not food related. He was getting to heavy . Peanut is now my about $10,000 rescue pit bull. lol I would sell my house to continue to give Peanut a good life. 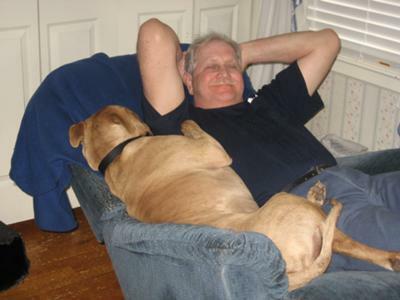 He thinks he is human being as all he has ever known is being in the house with my husband of 47 years and me. Peanut does not have a mean bone in his body. He does get mischievious with our 11 year old cat. lol I love Peanut's kisses and adoring eyes. Beautiful a very beautiful and touching story God bless you for saving Peanut, Peanut in turn has saved you..